In the cycle of our everyday lives, we are busy taking care of our needs like shelter, food, safety, emotional support, health care, human connection, and many other basics. Many years of our lives can be devoted to meeting goals like graduating from college, getting married, buying a house, rearing children, having a successful career, and staying healthy. This cycle of everyday life, our daily routine, is the plane of existence that most people are familiar with. It is the outermost circle enclosing the inner circles in the continuity of existence. People who are not awake to anything beyond such day-to-day existence can let life happen to them as if they are in a trance. To be in the trance is to live life in such a way that one is completely identified with her or his social role and status. This kind of over-identification can prevent people from living an authentic life and going beyond the mundane. It can also lead to a life devoid of depth and meaning. Most people want to live a prosperous life, and the pathway to successful life is often presented to them as a ladder to climb. 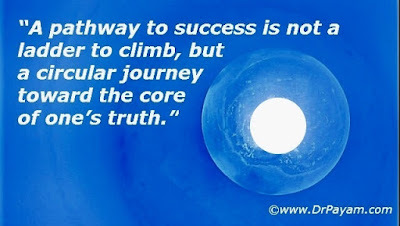 In fact, a pathway to success is not a ladder to climb, but a circular journey toward the core of one’s true essence. We can embark on this journey of self-discovery through deeper psychological and spiritual work, which will enable us to experience the numinous in everyday life and transform our challenges into the gold of consciousness. When we work on knowing ourselves and bringing this consciousness to our day-to-day living, we are transforming our lives. We no longer obsessed with our personal goals, and we can develop a deeper understanding of the meaning of success. One need not abandon the business of navigating the cycle of everyday life in order to participate in the journey of self-discovery, but we need to navigate with a quality of consciousness that not only helps fulfill our responsibilities, but also get closer to our “True Essence.” There is nothing wrong with making money and enjoying the fruits of our labors—as long as we are not doing it for the purpose of covering up our inferior feelings or falling into a trance of over-identification with status. As stated earlier, on the journey of self-discovery, the progression into the core of the circle, our True Essence, is a circular motion, not a ladder. We go around and around the circle of existence, and we can get stuck in one track if we don’t do the inner work of understanding ourselves. It is like walking a labyrinth only a short ways and staying on the periphery, not going to the middle to receive the spiritual and psychological gifts on offer there. To move to the next track and journey toward the core of the circle, we must make a commitment to knowing ourselves. Each moment of growth and insight can help us journey closer. The more evolved we become, the closer we get to the truth of who we really are. To know ourselves, we need to encounter the unconscious. Having a guide in this process is essential. We need support when attempting to understand what we might encounter. There are parts of us of which we are not completely conscious. We could think of them as layers of our personality that impact our interaction with ourselves and the world. How these layers impact us depends on our relationship with them. Progress toward our True Essence is difficult if we don’t have a conscious relationship with different parts of ourselves. Also, working with the unconscious is important, since within our unconscious resides creative potential and the answers to many of our life’s mysteries. Writing is one of the simple yet valuable tools we can use for self-discovery and to build relationships with different aspects of our personality. I find it very helpful to write in my journal about the way I handled certain life challenges without being hard on myself. Journaling helps me learn more about myself and become more aware. Also, journaling can be a place where we record our dreams. In working with our unconscious, we are helped by paying attention to the images that manifest in our dreams. By analyzing our dreams with the help of a trained person, we can learn about the content of our unconscious. On our journey toward our True Essence, we need to develop a quality of attention that focuses on the present moment, despite all distractions. One way we develop such presence is by paying attention to our breathing. Awareness of breath is a simple practice that helps us to be in the moment and develop a deeper relationship with ourselves. We can also bring our awareness to the present moment by paying attention to our bodily sensations. For example, sitting on my office chair, I can notice the comfortable experience of having my back supported by the chair. Such a sensation of comfort can only be noticed in the present moment. Reflecting on our life experiences and discovering their meaning not only gives our lives a sense of purpose but also enriches our life journey. The journey of knowing oneself is a very personal experience for each traveler. The goal is to have an ongoing connection to our True Essence. Everyone can find her or his own unique approach to a meaningful existence. My initiation to this journey happened at a young age with the realization that my sexuality made me different. My attempt to understand the meaning and purpose of my gayness pushed me out of the collective into a journey of self-reflection and self-understanding. At the same time, this journey empowered me to stand up to homophobia. For others, this change can happen when they turn losses and tragedies into transcendent experiences and, as a result, become evolved human beings. Connection to our True Essence is not the end of the journey. It can be a doorway to an even stronger, more conscious connection to something greater than ourselves. It can be imagined as a drop of water merging with an Ocean, wherein one can experience Oneness. Each traveler can experience her or his unique merger with the Ocean of Oneness. There is no end to the journey of knowing oneself for the sake of forging a union with a power greater than oneself. The path is infinite, and it starts with a willingness to wake up, depart from the periphery, and step inside.